It's been over thirty years since an admiring audience watched Alexander Calder complete the painting of his abstract design on a Braniff jet at the 1975 Paris Air Show. 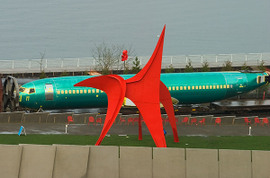 But almost every week you can see a Boeing jet fuselage (from the French fuselé, spindle- shaped, no less) roll by Calder's Eagle, on a train, right through the middle of a museum. Good seats are usually available. Earlier this week, Harvard University Graduate School of Design announced the Veronica Rudge Green Prize in Urban design was awarded to Weiss/Manfredi Architects in recognition Belltown's (OK, and Seattle's) Olympic Sculpture Park - in large part because their design makes such seemingly incongruous events commonplace. As the judges put it, "The park becomes a piece of sculpture itself, reframing its urban condition." As the Bent sees it, thanks to Weiss/Manfredi's design, the cars, trains, boats, and yes, planes do a fascinating job of re-framing the art. I just don't know what to comment here. It must be a fascination-in-motion. Nice mention in this morning's paper. That Eagle was made for the Fort Worth National Bank. It was in Fort Worth until 1999. We miss it! Nice painting! I hope good seats are usually available.